My new home office is the only room in this house that will not be painted. Since taking over this home somewhere just outside of Halifax, I have grown very fond of my work space. 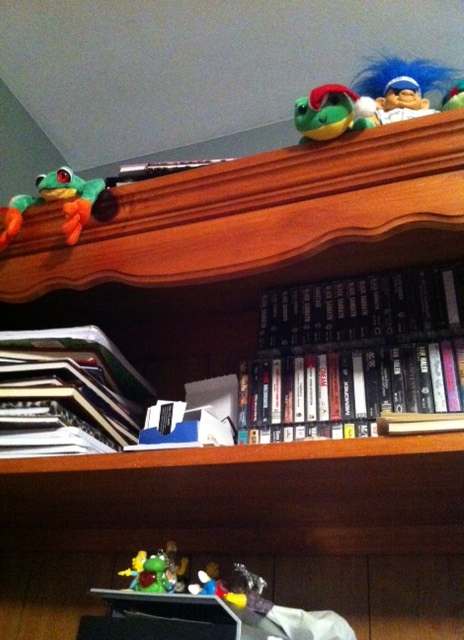 The top shelf you are looking at is my cassette collection hanging out with a large surplus of notebooks. Although not in the photo, to the left of my monitor is a photo taken in 2005 of me and one of my hockey heroes, Darryl Sittler. I’ll post that photo sometime. Sittler is still one of the greatest of all time, and because of the way he was treated by Bobby Clarke, one of the reasons I will forever loathe the Philadelphia Flyers. The computer speakers are blaring Frank Zappa’s last major work, Civilization Phaze III. It is a brilliant display of electronic music wizardry from someone I consider an influence. It is a sonic exploration of sound borderlining on madness. Clearly, a composer working hard to make his final statement. Frank was studio bound towards the end of his life and spent most of his time composing on a Synclavier. If Frank was still around today, the technology available to him would no doubt make him create even more works even similar to this. The beauty of this masterpiece is that it often sounds like a full orchestra. It probably fooled a ton of people when it was released. Frank’s use of humour certainly has inspired humourists who are as Frank would say “Funny to a Few”, to come up with hilarious titles to stories and music. The response to the release of Planned UnParenthood so far has been excellent. I was pleased to hear from several parents who wrote to me. Many told me they understood where I was coming from. Some have said they will be more mindful of the fact that some people will not have children by choice. In another instance, a reader gave me an acknowledgement on my salute to those who adopt. You will have to read it yourself to see what I am referring to. You can buy a copy of Planned UnParenthood Creating a Life Without Creating through the following links. You can find it at other online retailers just by entering the ISBN 9780988148604 into Google and seeing the search returns. Available worldwide! Thank you for reading, and for your support. Posted in Notes from the Frogpond.Tagged Bobby Clarke, books, cassette, children, composing, Darryl Sittler, Frank Zappa, funny, humour, ISBN 9780988148604, music, Office, Painted, Philadelphia Flyers, Planned UnParenthood, Tapes, writing.